After hearing the touching story of Amanda*—a victim of domestic violence who had been brutally beaten —Dr. Neil Zemmel wanted to help her recover from some of the aftermath of her past. 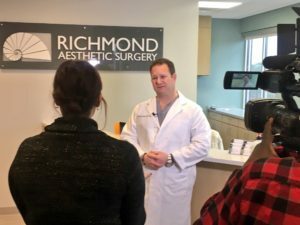 Dr. Zemmel will be working with Amanda to perform breast revision surgery at no cost to replace the implant that had ruptured as a result of her attack. They look forward to helping her restore her appearance to resemble what it once was before her life-threatening encounter. Amanda’s story will be shared by WWBT/NBC 12 Richmond on Thursday, February 2nd at 5pm for those who would like to learn more about her incredible journey. Throughout the day, NBC 12 will be offering a domestic violence hotline, as well as have counselors available on-site.